Bringing a new baby into the world is a big job and it’s one that usually involves several people. While mama has the toughest job, the delivery nurses there to help her don’t have an easy job either. To thank your delivery nurse for the important work she does, consider one of these gift ideas. A delivery nurse usually does what she does because she loves helping people. This generally speaks to a humble and caring personality, so one of the best gifts to give is one that she can share. A gift basket of tasty treats that she can share with her co-workers will be much more meaningful than something that is just for her. 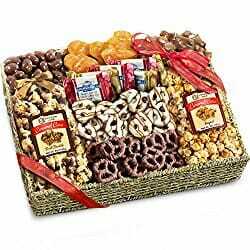 This gift basket includes chocolates, caramels, caramel corns, peanut brittle, and more. It’s all packaged in a keepsake seagrass basket that she’ll be able to reuse. Be sure to include a handwritten note to thank her for all she does. You can mention that she’s welcome to enjoy the treats herself or share them with her family or her coworkers. Some gifts are just evergreen. It doesn’t matter who the recipient is or what the reason is: chocolate always wins. This 70-count chocolate box from master chocolatier Godiva is sure to be hit. In the case of a gift for a delivery nurse, chocolate is an ideal way to say thank you. After all, a sweet nurse has helped bring your sweet little one into the world so what better way could there be to say thank you than the gift of something sweet? This is another one of those gifts that nurses will love sharing with their co-workers. In your accompanying card, you might want to suggest that they first call dibs on their favorite variety to make sure they aren’t left with the ones nobody wants. 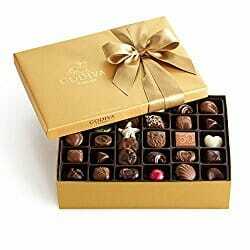 Then again, with Godiva chocolates, are there any that nobody wants? Delivery nurses often work long shifts and most of them live on coffee. Hospital coffee isn’t always the best but many hospitals now have Keurig machines. You might want to call to check with the hospital to see if they have one. If they do, a K-cup variety pack is an ideal gift. It’s one that can be shared with co-workers, something most nurses will appreciate. This 72-count variety pack includes regular coffee blends from Caribou Coffee, Tully’s, Newman’s Own, Green Mountain, and The Donut Shop. This includes light roasts, dark roasts, and roasts that lie somewhere in between. 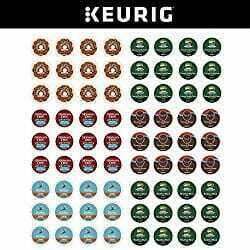 There are also a few flavored varieties like the Caramel Vanilla Cream K-cup from Green Mountain. The only thing missing from this variety pack is decaf but most nurses won’t mind this exclusion. For the hospital that doesn’t have a Keurig machine, you can instead gift some high-quality beans. 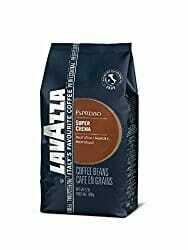 Every coffee snob knows that really good beans make a huge difference. If there is a coffee shop in the hospital or nearby, a gift card makes a great gift. Dashing off for coffee during a break offers nurses the perfect combination of getting away for a bit and getting that java pick-me-up they need. Since you’ll typically interact with several delivery nurses, you’ll probably want to buy several gift cards. 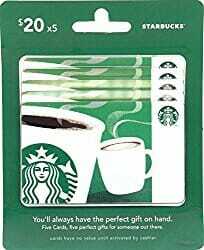 This 5-pack of Starbucks cards will give a handful of nurses several a real treat in the form of $20-worth of coffee or snacks. If the nearby coffee shop for your hospital isn’t a Starbucks, just find a gift card for whatever brand is nearby. The message is printed on both sides so when someone sees her drinking from the mug from any direction, they’ll be able to see that they are in the presence of a legit superhero. The ceramic mug is microwave and dishwasher safe. It’s available in two sizes. Nurses are always on the go. To keep their coffee or tea warm while they go about their busy day, there’s nothing like a stainless steel travel mug. This travel mug not only keeps their drinks warm but it will also warm their hearts with the fun message. 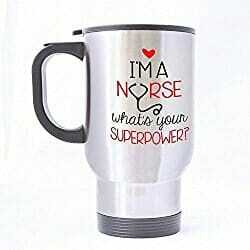 It reads “I’m A Nurse What’s Your Superpower?” This is a fun message but when given as a gift from a patient, it’s also a reminder that what they do is very special and important. This is a great gift on its own or given along with some coffee or a coffee gift card. When you spend your days wearing scrubs, it can be hard to find ways to let your personality shine through. That said, many L & D nurses enjoy finding little ways to express themselves. If you’ve ever seen the movie Office Space, you know the term flair. Well, pins and buttons are making a big comeback these days. This fun set of flair for delivery nurses will let your nurses have a little fun and make their scrubs a little more interesting. The set includes 12 pins, with a mix of serious and fun messages. As a bonus, these pins are sure to make future laboring women smile when they encounter your nurse. 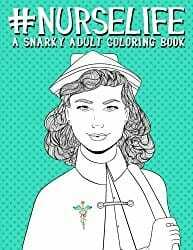 Adult coloring books are all the rage these days, as coloring has been proven to be a good way to release stress and relax. Some adult coloring books are very zen and just feature geometric patterns while others add some humor to the coloring experience. This is one of the latter and it’s full of jokes that nurses will really appreciate. Each page has some kind of pattern or image to color along with a message or one-liner to color and to make the nurse smile. 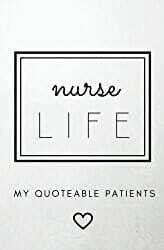 One example is “Never pass up an opportunity to pee.” That’s a piece of wisdom that any nurse will understand well. Throw in a nice set of colored pencils and your delivery nurse will soon see all the stress of the job melt away, from both coloring and laughing. When working as a delivery nurse, you share a lot of special moments with new parents. You sometimes witness miracles and you sometimes experience tragedies. But you also hear your patients say a lot of quotes you’d like to remember. This includes both the beautiful and profound as well as the hilarious and absurd. Just like how parents often record the things their quoteable kid says so they can always remember, this journal helps the nurse keep track of the particularly notable things their patients say. Of course, working as a labor and delivery nurse, they’ll often hear seemingly mild-mannered women swearing like sailors. When you give this journal as a gift, just be aware that whatever you say while in labor might well be the first note to be recorded for posterity! Delivery nurses make a profound difference in the lives of the mothers they help but it can sometimes feel like a thankless job. This is a special gift that will really help remind them of just how profoundly they touch people’s lives. 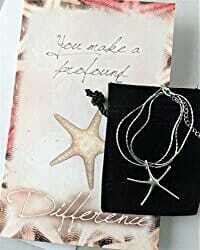 It’s a beautiful silver starfish necklace and a card with a story about starfish and the very special difference one person can make. This is the kind of gift that may well result in some very happy tears. The story on the card is adapted from the famous starfish story by Loren Eiseley and the message is really perfect for anyone who makes a difference. For the nurse who might be burned out, it’s a good reminder of just what a big difference they make. A nurse cannot survive on coffee alone. For optimal health and for feeling good through those long days at work, they really need to be drinking a lot of water. This water bottle from Hyrdo Flask has been consistently ranked as the very best water bottle in terms of keeping water cold. This is because it has a double wall and vacuum insulation. Water will stay cold for up to an incredible 24 hours! A straw lid is included with this, so it will be even easier to help them stay hydrated on the go. You have your choice of a number of fun colors. We suggest a bright and bold color because it will help your busy nurse keep track of it more easily. Have we mentioned that being a labor and delivery nurse is hard work? Enjoying a glass of wine at home after a long day of helping welcome new little ones into the world is entirely their prerogative. This lovely large, stemless wine glass is perfect. 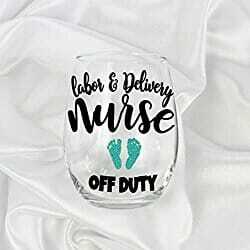 The glass reads “Labor & Delivery Nurse Off Duty” and features a few baby footprints. This gift is a nice way to acknowledge that if anyone deserves a drink at the end of the day, it’s a delivery nurse. You might want to throw in a bottle of wine as well but you’ll want to make sure that it’s okay to bring that to the hospital. This shirt won’t be ideal for every delivery nurse but there are some nurses that will find it hilarious. If you get to know your delivery nurse well and know that he or she has a great sense of humor, you might just knock it out of the park with this punny gift. The shirt is available in both Men’s and Women’s styles and you have your choice of a few different colors and a range of standard t-shirt sizes. This shirt is also a great gift for someone you know who has just gotten hired as a labor and delivery nurse. Working as a delivery nurse means spending long hours standing up, day after day. This can really take a toll and it can lead to some pretty tired feet and legs. You might think that giving socks to your nurses is kind of a weird gift but a delivery nurse is sure to appreciate a good pair of compression socks. These are basically really tight socks. Compression socks help to boost blood circulation and reduce lactic acid build-up. This results in less fatigue and pain at the end of the day. You can write something on your card about how they stood by your side during a special moment and you want to help support them like they supported you. Which one of these gifts will you buy for your delivery nurse? Let us know in the comments! Do you have any other ideas for great delivery nurse gifts? Please share! And if you are a labor and delivery nurse, what do you think? Would you appreciate receiving any of these gifts?